The study appears in the International Journal of Sustainable Transportation. The researchers found that extending the life of pavement through preventive maintenance can reduce greenhouse gases by up to 2 percent; transportation agencies can cut spending by 10 percent to 30 percent; and drivers can save about 2 percent to 5 percent in fuel consumption, tire wear, vehicle repair and maintenance costs because of smoother surfaces. The research will help transportation agencies choose appropriate maintenance strategies that consider environmental impacts in decision-making. "When pavement is in its early failure stage, preventive maintenance can restore performance and extend pavement life with lower costs," said study lead author Hao Wang, an associate professor who focuses on infrastructure engineering in the Department of Civil and Environmental Engineering at Rutgers University-New Brunswick. "Pavement preservation leads to significant environmental benefits due to the improved surface condition, which results in smooth pavement, saves energy and reduces user costs." The transportation sector is the largest source of greenhouse gas emissions, primarily carbon dioxide from cars, trucks and buses. The researchers used the long-term pavement performance (LTPP) database maintained by Federal Highway Administration of U.S. Department of Transportation to measure the environmental impact of roadway repairs, especially preserving asphalt pavement, in terms of carbon dioxide emissions linked to global warming. The study used a full life-cycle approach to look at the carbon footprint of common ways to preserve pavement. 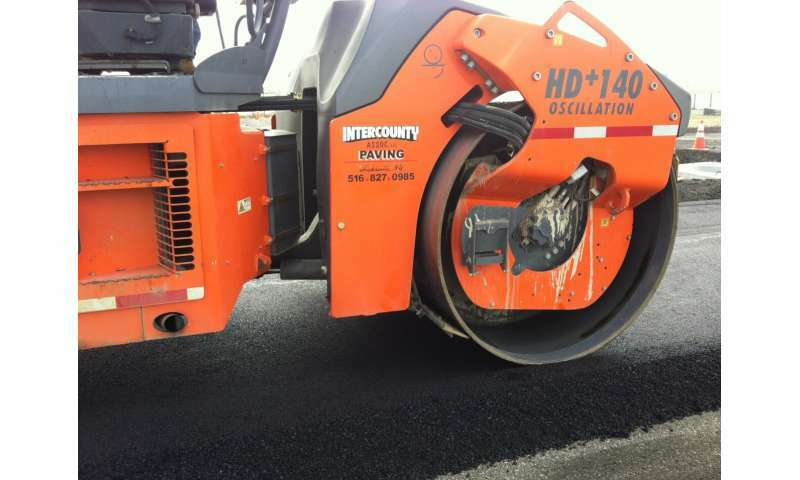 Treatments include thin overlay (placing up to 2 inches of asphalt on roads), chip seal (spraying asphalt emulsion on pavement and laying aggregate), slurry seal (spreading a slurry over pavement) and crack seal (filling cracks with rubberized asphalt or polymer-modified asphalt with some filler). The study found that thin overlay leads to the greatest overall reduction in carbon dioxide emissions—2 percent—because of a large decrease in road roughness. The crack seal method led to the lowest emission reduction—0.5 percent—but all preventive maintenance methods reduce emissions overall. The researchers further developed the life-cycle assessment tool for evaluating the environmental impact of roadway projects. The study included researchers at the Rutgers School of Engineering and their collaborators at North Dakota State University and Al-Mustansiriyah University in Iraq.